Become a Citizen Scientist and Help Research Wild Leeks in Maine! Start indoors: Melons, squashes, cucumbers. Direct seed outdoors: Beets, carrots, leaf and head lettuce, peas, radishes, spinach, Swiss chard, turnips. Transplant outdoors: Broccoli, Brussels sprouts, cabbage, cauliflower, leeks. Start indoors: Broccoli, Brussels sprouts, cabbage, cauliflower for fall crop. 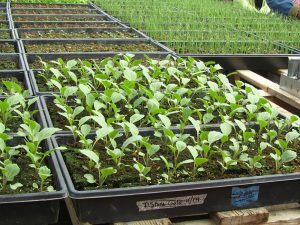 Direct seed outdoors: Beets, leaf and head lettuce, peas, radishes, spinach, turnip. Harden off your vegetables and bedding seedlings by leaving them outside in a protected area for the day and bringing them under cover at night. 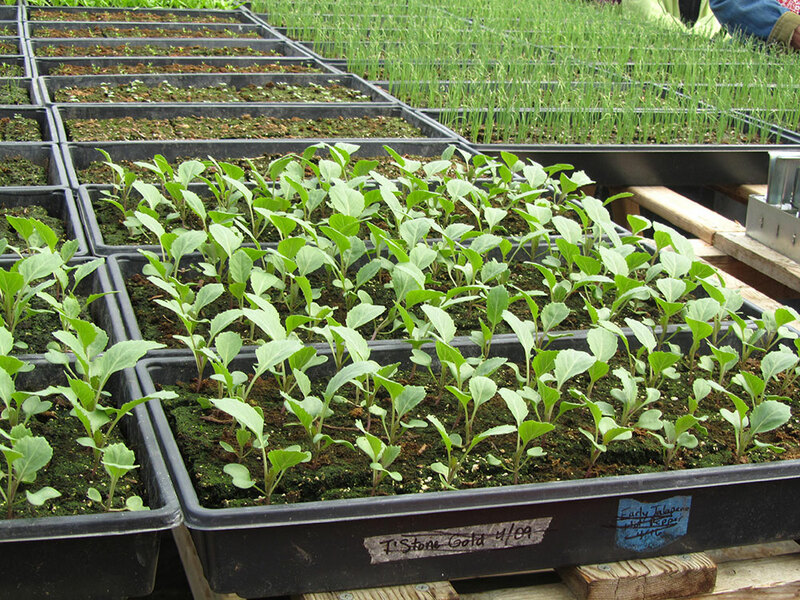 Do this for 7-10 days before planting out into beds, containers, and baskets. Note the last frost date for your area. Include flowers in your vegetable garden to attract pollinators and other beneficial insects. Celebrate Mother’s Day, Sunday, May 8. Adopt a Mom — someone who might need cheerful flowers, a nice meal, or help in the garden. Prune forsythia, lilac, spirea, and other spring-blooming plants after they’ve flowered. For more information, watch the videos in Bulletin #2169, Pruning Woody Landscape Plants. Mulch your perennial beds with dark bark mulch to conserve moisture and prevent weeds. Avoid covering the crowns of herbaceous plants and the trunks of woody plants. Mulch sections your vegetable garden with newspaper and cover with straw, shavings, woodchips or other material. You can even use carpet scraps in pathways. Use small hoops with row cover over brassicas and cucurbits to keep out pests. Remove once the plants are large enough to withstand some damage. Read up on growing asparagus so this delicious perennial will thrive year after year. Clean your hummingbird feeders twice a week (if you use them). Mix your own “nectar”: ¼ cup of table sugar per cup of boiling water. (No dyes, no honey!) Let mixture cool before filling feeder. Do daily tick checks and learn how to identify and avoid them. Enjoy spring herbs like chives and lovage. Both freeze well — just chop, lay on cookie sheets in the freezer, and place in freezer bags for later use. See if your local school needs help in their garden, especially during the summer! What is a community garden? The basic definition implies a plot of land gardened by a community of people. This belies the true definition of a community garden. These gardens come in a variety of shapes and sizes and serve different purposes. The land can be town owned, privately owned or leased, on school grounds, at churches or other civic institutions. Many follow a common model of renting out small plots of land or raised beds for a growing season at reasonable rates. This allows people who lack land of their own to enjoy the experience of gardening. Very often a community garden will also have “Common Good” plots. These are plots that are gardened by the entire group; the harvests are then donated to food pantries or other entities that provide fresh food to people who are food insecure. 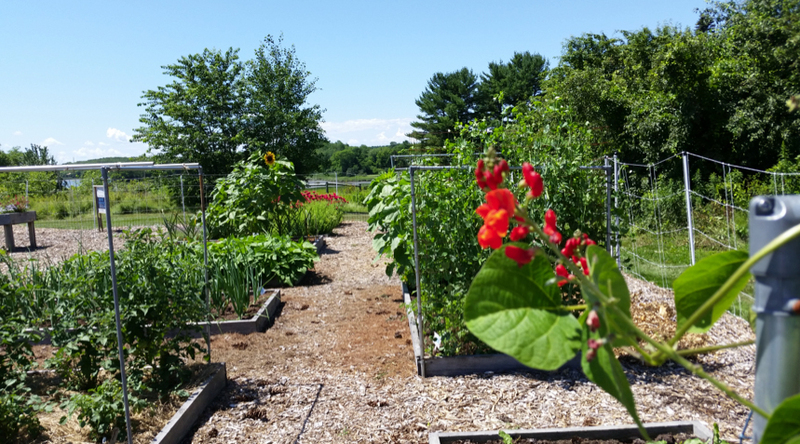 Some community gardens are entirely devoted to growing food for pantries. The gardeners come from all walks of life and have varying levels of garden expertise. What these gardens all share are groups of individuals that desire to grow, eat, and share healthy fresh food. Penobscot 4-H Notes: Victory Gardens, The Penobscot County Farm Bureau News, Bangor, Maine, June 1945, Vol. 26, No. 6. The community gardening movement in America has a very long history and the reasons for the creation of such gardens varied greatly based on the circumstances of the day. In 1918 during World War I, the government actively promoted community gardens to expand domestic food supply. The Great Depression saw 23 million households participating in community gardens, providing many unemployed people with a means with which to grow their own food. The 1940s gave rise to the Victory Garden, to grow food for personal consumption and improve morale during World War II. After the war only a few gardens remained, but these would become the bones of a rebirth of the movement in the 1970s. Community gardens at that time were a direct response to rising inflation, urban abandonment, environmental concerns, and a desire for neighborhoods to reconnect. The community garden movement has exploded in recent years. A poll commissioned by the National Gardening Association found that between the years of 2008 and 2013 the number of community gardens increased 200%, up from 1 million community gardens in 2008 to 3 million community gardens in 2013. Maine’s Cumberland County is home to over 30 community gardens, with the large majority of them having been established within the past 15 years, bearing out this trend. Successful community gardens share many common ideals. Good governance is paramount. Steering committees or boards govern many community gardens and decisions are made jointly. Almost all of them incorporate volunteerism and have plot owners participate in shared chores. Many have written rules that include expected plot maintenance and the non-use of chemical pesticides, herbicides, and synthetic fertilizers. Maine state law prohibits the application of any material applied to manage a pest (even those listed as organic and unrestricted) on property open to use by the public by those without a commercial applicator license. Additionally, Maine state law also states that anyone wishing to apply pesticides must have prior permission from the landowner. One of the best ways to make sure garden members understand the law is to require a signed document showing they agree to adhere to a pest management policy and verbally explain the policy during orientation. An annual policy reminder for returning members is also suggested. The reasons often sited for starting a community garden or joining an already existing garden are as diverse as the actual gardens. The most common reasons are: access to healthy food, social engagement, neighborhood revitalization, and community building, as well as education and exercise. There are obstacles that must be overcome at the onset of a community garden project. One of the most important and obvious is the acquisition of land and a reliable water source. Many gardens have truly amazing stories behind how they attained the plots of land that have become their gardening sanctuaries. Another problem that frequently arises is a lack of interest on the part of the gardeners. Indeed collaboration seems to be key to the success of a community garden. Let’s Move includes a community garden checklist, with information provided by USDA’s People’s Garden Initiative. For more gardening resources, visit www.usda.gov/peoplesgarden. Growing up, I remember the two types of Irises my mother had: a solid blue type and a type that had yellow falls with brown upright petals. I still have descendants of these two in my landscape. I have found Irises to be very hardy, long-lived perennials that don’t need a lot of care. There are many shapes, sizes, bloom times, and colors to choose from. Iris flowers have 6 petals with 3 upright petals called standards and 3 that hang down called falls. Bearded Iris, the type my mother had, have a fuzzy line or beard that runs down the middle of the falls. Sometimes they are called German with the botanical name Iris germanica. 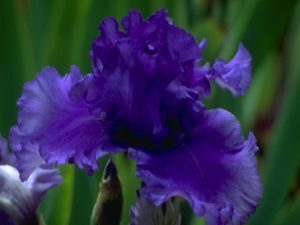 Bearded Iris are very hardy and can live through severe droughts and cold. The sword-shaped leaves remain green until the late fall in Maine. Most will grow to be 2 to 3 feet tall (although I had one that must have been 4 feet tall.) Bearded Iris are perfect for the beginning gardener. Japanese (I. kaempjeri) and Siberian (I. sibirica) are the most commonly grown breadless species of Iris. Japanese irises have soft, drooping standards and falls. The plants will grow 2 to 4 feet tall and flowers are borne on long stems. Siberian irises have stiff, narrow falls and narrow, upright standards on stems that are 18 inches to 2 feet tall. Beardless types, which thrive in moist soil, frequently are planted on stream and lake banks. 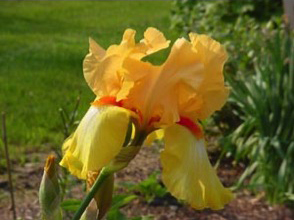 Crested irises have a small raised area, or crest, in the middle of each fall. Often, the color of the crest contrasts with petal colors. One of the more popular crested irises is a dwarf species I. cristala. Bearded, beardless, and crested irises grow from a thick, underground stem — called rhizomes — that store food produced by the leaves. Rhizomes grow slightly below the surface of the ground or at ground level. Every year, underground offshoots develop from the original rhizome. The offshoots may be divided and transplanted to grow new irises. Irises grown from rhizomes should bloom the next spring after planting. Best time to plant is in the late summer so they will get well established in the soil before winter. Some local nurseries sell started rhizomes that can be planted earlier in the garden. Irises need full sunshine, good air circulation and southern exposure. Bearded and crested irises need sweet soil with good drainage since their rhizomes may rot in soil that holds water around them. Beardless types need moist soil that is slightly acid. Prepare the bed 1 to 2 weeks before planting by digging at least 18 inches deep to loosen the soil. Poor soil should be amended with fertilizer and organic matter to improve the soil structure and fertility. If you use commercial fertilizer be sure to mix with soil so that the lumps of fertilizer do not touch iris roots. To plant, dig a shallow hole large enough to receive the rhizome you are planting. Form a cone of earth in the center of the hole for the planting base. Place the rhizome on top of the cone, even with the ground surface. Carefully spread the roots around the cone. Fill the hole with soil and press firmly in place around the rhizome. Water immediately. Some of the rhizome should be visible and not covered with soil. Irises will grow in the direction of the fan of leaves, so when planting several rhizomes point each fan away from other plants in the group. Before replanting full-grown iris, cut the leaves to one-third their full height. See Kansas State University’s YouTube video for more information on dividing iris. The first fall you can protect the newly planted rhizomes with mulch, but after the first winter I just leave their leaves in place for winter cover. The biggest problem is keeping weeds and grass away from your iris bed. If you use a hoe or hand cultivator, be careful not to injure the rhizomes or roots. Once the flowers have faded you can cut them off unless you want to obtain seeds. Plants that are growing well with good green foliage usually don’t need additions of fertilizer. If fertilizer or compost is added, do it after plants bloom. My garden now boasts flowers of a variety of colors: blue, yellow, blue with white, yellow with brown, brown, red, and white. Every 3 to 5 years you can plan to divide your beds and share the bounty with family and friends. Visit the University of Maine Cooperative Extension Master Gardener Volunteer Demonstration Garden at Rogers Farm in June to admire a stunning display of a variety of iris in the center of the gardens. The Maine Iris Society generously donated plants in the two iris plots. Source: Growing Iris, Utah State University, extension.usu.edu/boxelder/files/uploads/Iris.pdf, accessed April 19, 2016. Mike Bendzela, York County Master Gardener Volunteer, demonstrates that Maine Harvest for Hunger volunteering is “heartfelt”! Master Gardener Volunteers working in Maine Harvest for Hunger statewide continue to astonish us. UMaine Extension Master Gardener Volunteers have organized home gardeners, farmers, businesses, schools, and civic groups to grow, glean, and donate high-quality produce to distribution sites (pantries, shelters, community meals) and directly to neighbors in need for 15 years now. 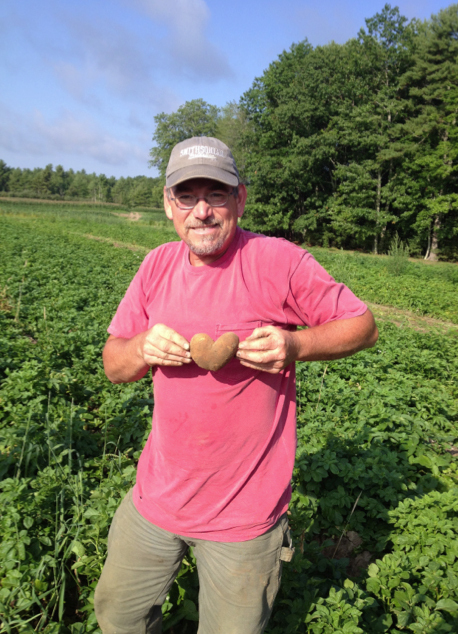 In 2015, Maine Harvest for Hunger’s statewide growing and gleaning efforts exceeded annual poundage of 300,000 for the first time. A total of over 318,000 pounds of fresh locally grown produce was donated to 188 distribution sites all across Maine. Nearly 500 program volunteers in 14 counties collectively logged more than 5,000 hours, and the value of the produce was over $537,000, based on an average $1.69 per pound. Another milestone reached in 2015 was exceeding 2,000,000 pounds donated since our programs inception 15 years ago, reaching a new total of 2,197,000 pounds. This is all in an effort to mitigate hunger, improve nutrition and health, and help recipients develop lifelong, positive nutritional habits. Maine Harvest for Hunger has improved the efficiency of supplying low-income clients with fresh produce. Through a dialogue between recipients, donors, Master Gardener Volunteers, and UMaine Extension staff, the Maine Harvest for Hunger team has made significant progress in expanding the number of offerings utilized by recipients, minimizing donation waste, and extending the donation season. Shelters that years ago didn’t want produce such as kale are now using our recipes and getting clients to taste-test, making them more likely to adopt a healthier diet. Pantries are minimizing waste by networking more regularly to match excess in one site with need in another site, sharing best practices for handling and distributing produce, and processing less marketable produce into nutritious food. To extend the season, donors are offering more storage crops that can be distributed over a longer time period. Maine Harvest for Hunger volunteers Dennis and Julia Violette. Photo by Clare Cole. “Clients at homeless shelters are very interested in learning to grow their own food and are helping to establish a new four-season garden on the grounds of York County Shelter. The staff is committed to engaging residents to work in the garden, help in the food pantry, and in some cases go out with volunteers to help glean. This is great for their health and morale,” said Kristine Jenkins, executive director of Partners for a Hunger Free York County. Maine has the highest rate of food insecurity in New England, and ranks 12th in the United States. According to the Good Shepherd Food Bank of Maine website, the USDA estimates that 16.2 percent of Maine households, or more than 208,000 individuals, are food insecure. Twenty-four percent of Maine’s children are food insecure (64,200 children) (Feeding America). Twenty-three percent of seniors experience marginal, low, or very low food security (AARP). Forty-three percent of food-insecure people do not qualify for food stamps or any other government program. It is especially challenging for food insecure individuals to afford high-quality, fresh, nutritious food, and Maine’s emergency food system has seen donations of fresh produce decline significantly in recent years. To get involved with Maine Harvest for Hunger, contact your local Extension office. They’ll be able to connect you with donation sites, suggest what crops might be most useful, and possibly link you to alternative ways to lend a hand if you don’t have your own garden space. For more information, contact Frank Wertheim at 207.324.2814 or frank.wertheim@maine.edu. 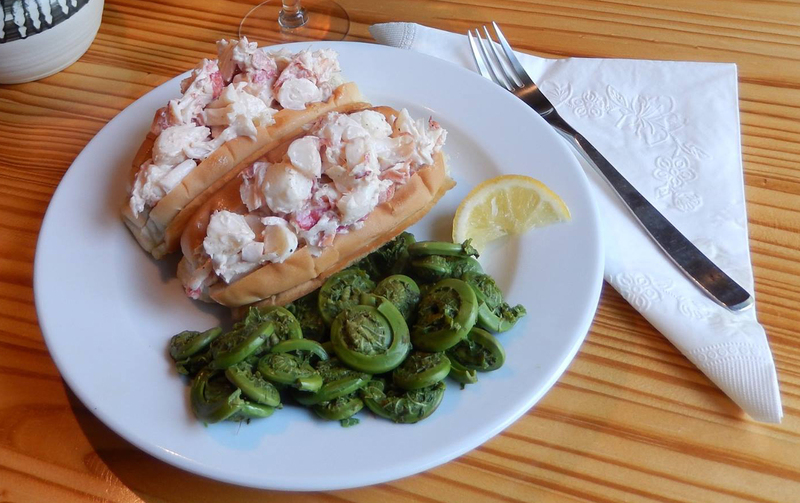 Two of spring’s early edible treats in Maine include rhubarb and fiddleheads. Both of these foods are a pleasure to enjoy in your favorite recipes and both are very easy to preserve. Once preserved, they can be used and enjoyed again in the off-season. If you are looking to amp up your intake of local foods, preserving is a skill to learn to help extend your access to local foods year round. View a listing of our hands-on food preservation workshops. 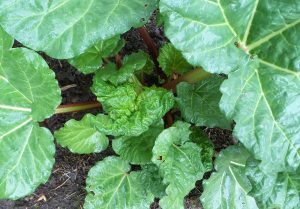 To store rhubarb, cut off the leaves, wash the stalks, and store them in a plastic bag in the crisper of the refrigerator. Use within one week. (Caution: Rhubarb leaves contain a toxic substance that makes them poisonous. Be sure the leaves are removed before using the stalks. Discard them without cooking or eating.) Find recipes on how to use fresh rhubarb in Bulletin #4266, Vegetables and Fruits for Health: Rhubarb. Freezing rhubarb is a simple and quick way to preserve it. View our video on freezing rhubarb for details. Because rhubarb is a high-acid product, it can safely be processed in a boiling water bath. For directions on how to can stewed rhubarb, see Selecting, Preparing and Canning Fruit: Rhubarb — Stewed from the National Center for Home Food Preservation. Fiddleheads, an early spring delicacy throughout their range, are the young coiled fronds of the ostrich fern (Matteuccia struthiopteris). Many people mark the arrival of spring with a fiddlehead-picking outing. But, shh, don’t tell where your pickin’ spot is! Some important food safety advice for fiddlehead consumers: The Center for Disease Control and Prevention (CDC) has investigated a number of outbreaks of food-borne illness associated with fiddleheads. The implicated ferns were eaten either raw or lightly cooked (sautéed, parboiled or microwaved). The findings of this investigation recommend that you should cook fiddleheads thoroughly before eating. Under no conditions should fiddleheads be consumed raw. Fiddleheads can be safely cooked using two different methods, boiling, and steaming. Boiling: Bring lightly salted water in a pot to a rolling boil and add washed fiddleheads. The water should fully cover fiddleheads when added. Bring the water back to a steady boil and hold for 15 minutes. Steaming: Bring a small amount of water to a boil preferably in steam apparatus. Add washed clean fiddleheads and steam for 10-12 minutes. Serve at once with optional melted butter and/or vinegar. The sooner they are eaten, the more delicate their flavor. They may be served, like asparagus, on toast. Cooked, chilled fiddleheads can be also served as a salad with an onion and vinegar dressing. Sautéing, stir-frying or microwaving ostrich fern fiddleheads are NOT recommended methods for cooking fiddleheads. Fiddleheads should be boiled or steamed prior to use in recipes that use further cooking methods like sauteing, stir-frying or baking. Source: Food Safety Tips for Fiddleheads, Health Canada. 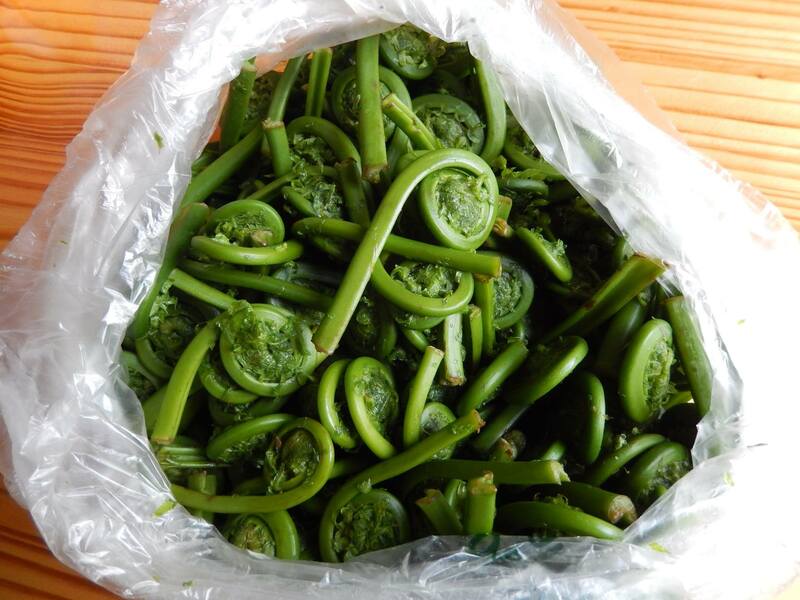 For information and recipes on how to harvest, clean, use, store and preserve (freezing and pickling) fiddleheads, see Bulletin #4198, Facts on Fiddleheads. Wild leeks: mature plants at left, with volunteer seedlings in foreground and right. Photo by David Fuller. The Maine Wild Leek Project is a collaborative project between the University of Maine Cooperative Extension and the Maine Natural Areas Program. The purpose of the project is to educate about wild leeks and to document the distribution of wild leeks in Maine as well as the relative size of given populations. This documentation will help the Maine Natural Areas Program expand their knowledge of wild leeks and improve opportunities for its conservation. 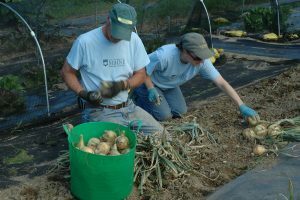 Additionally, participants will get more information from UMaine Cooperative Extension on wild leeks in months to come, including the latest research efforts on the effects of harvesting and a fact sheet on establishing your own wild leek patch. Please, consider participating in the Maine Wild Leek Project to help us better understand and conserve this species. Start by reading more about wild leeks in the April 2016 issue of Maine Home Garden News, then use our online form to report confidential information about any wild leeks you find. Please remember to respect landowner’s property: observe posted land and ask for permission to pass on un-posted land.